Our children are growing up in a whole new world, people! Smart phones and amazing technology are providing our kids with an entirely new means of being educated than we once were. It’s pretty incredible! With so much technology readily available, there are tons of choices. Here’s a great option for your younger child who is learning how to use a tablet – the VINCI tablet is an educational tablet designed for children. For starters, love the red grip around the VINCI. It’s really perfect for small toddler hands – plus it’s drop proof! I’ve had one too many iPhones break due to small hands dropping them. 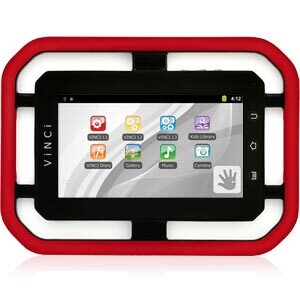 The VINCI comes pre-loaded with programs and learning tools that help to engage and educate your children. I will admit that the VINCI was probably a little young for my boys (ages 9 &6). They list it as being for kids ages 1.5-9 but I can see this really being best for the 2-5 year old crowd. Note: with WIFI and Parent Login, VINCI Tab instantly switches to regular tablet mode for high quality web browsing, emails, social networking and entertainment with HD video and music support. The VINCI is $199.99 and you can buy it on VINCI’s website.